The 2nd edition of our signature Two-Island Race saw a total of 10 Keelboats, 2 Cruising Multihulls and 6 Beach Catamarans taking part. The prevailing NE monsoon delivered, albeit a little delayed. In the IRC division, Born in Fire commenced her title defense in a strong position after the start, leading the fleet on the way down to South Nelayan. Despite their strong start, they could not seem to break away from fierce rivals Waka Tere, who eventually scored the victory on handicap – taking home the 2018 Two-Island Race Title. New entrant Red Rum looks promising as the current fastest boat in the CSC fleet – registering a 1.090 for their IRC. Scoring line honours and an eventual 3rd after corrected time for their debut race at the club, we look forward to great things from this racing machine. 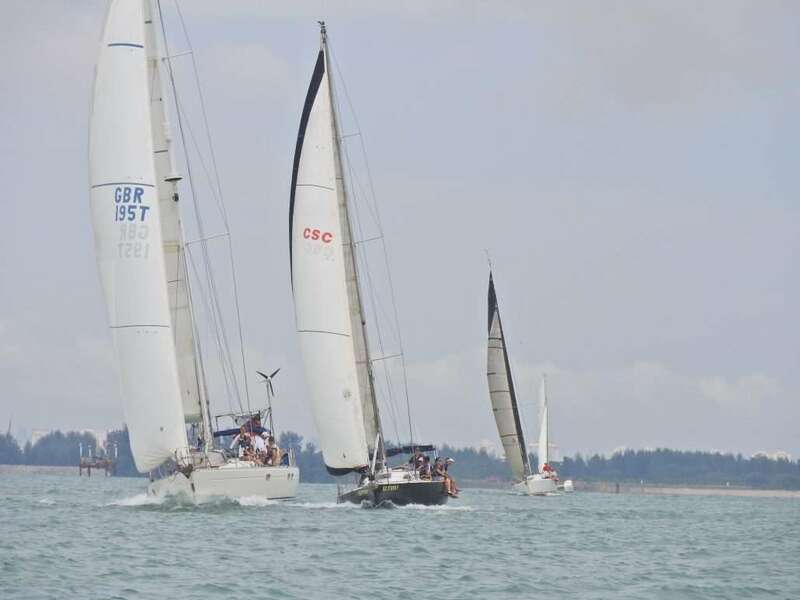 New Blue Eyes continue their fine form after their victory at the Round Ubin Race, scoring a dominant victory over defending champion Defiance and the largest boat in the fleet – 47 footer Temptress of Down in the PY Class. Ikaroa narrowly missed out on a podium position, and we are sure it would have been an even closer contest amongst the PY boats should Minx and Sangaree have flown their spinnakers for the race. A 2-way fight between Phoenix and Firefly saw the former clinch victory, as the rest of the Cruising Multihull fleet decided to take a break after a week in Indonesia competing in the Neptune Regatta. The beach catamaran class saw a boost in attendance, with a total of 6 boats taking part. Jeremy Nixon’s Bad Influence was forced to retire early in the race, suffering from a torn kite. Regulars Madfish II and Stray Katz finished in 1st and 2nd position after corrected time. We were also delighted to see Scott McCook and Alice Lim racing on the Viper, together with Louis Lim and new entrant Rene Hillig enjoying the race course and unadulterated winds. New records were set for all classes(yay!) – we’re looking forward to organising the Two-Island Race again next year! Thank you all who raced with us – see you again next week for the CSC Commodore’s Cup 2018!